17 March 2015 – The countdown to the opening of Ellesmere Port’s iconic new sports village is now on. 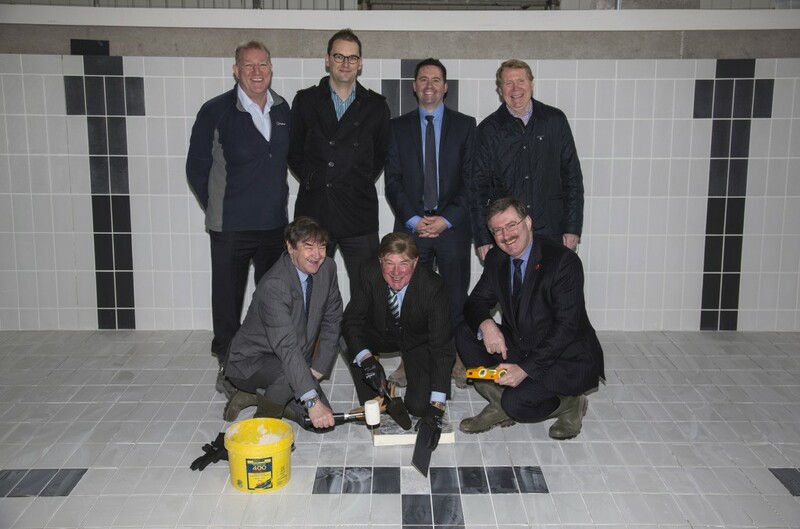 With the venue set to officially open in May, the Council’s Executive Member for Culture and Economy, Stuart Parker laid the last tile in the swimming pool to celebrate its structural completion at a special event yesterday (Monday). Council leaders were joined by guests including Chair of the Ellesmere Port Development Board, Robert Mee, representatives from Sport England and Brio Leisure and local members to mark the milestone in the project, which has been delivered by Cheshire West and Chester Council and its contractor Wates Construction. The ambitious £15million project has been funded by Cheshire West and Chester Council, with £1 million of National Lottery funding from Sport England’s Iconic Facilities legacy fund. Councillor Stuart Parker, Executive Member for Culture and Economy, said: “When Cheshire West and Chester Council came into being we identified culture as the key catalyst for growth in the borough. “Thanks to this strategy we are now seeing widespread regeneration and Ellesmere Port is seeing this more than most – with unprecedented levels of investment in the town from both the Council and private businesses and organisations. Ellesmere Port Sports Village features an eight-court badminton hall with a seating capacity of 1400 – soon to become home to the Cheshire Phoenix basketball team, an eight-lane competition swimming pool, 80-station gym and dance and fitness studios. Future expansion will provide a new 3G all-weather pitch due for completion this summer, which will complement the competition athletics track already in situ at the site. The building will have the capacity to host regional and televised events. Chair of the Ellesmere Port Development Board, Robert Mee, said: “The scale and variety of sporting options available at the new facility is absolutely tremendous and will provide a terrific venue for residents. Local member, Councillor Brian Jones, said: “I officially opened the EPIC leisure centre with Bobby Charlton back in 1983 and I welcome the new Sports Village. The venue will officially open on Tuesday, May 26 2015. Opportunities to tour the facility prior to this date will be on offer to view facilities and get membership information.